This library provides APIs to the kernel interfaces of the routing family. View and modify the configuration of physical and virtual network devices. In networking several terms are commonly used to refer to network devices. While they have distinct meanings they have been used interchangeably in the past. Within the Linux kernel, the term network device or netdev is commonly used In user space the term network interface is very common. The routing netlink protocol uses the term link and so does the iproute2 utility and most routing daemons. See Netlink Library - Message Types for more information on common semantics of these message types. All netlink link messages share a common header (struct ifinfomsg) which is appended after the netlink header (struct nlmsghdr). The meaning of each field may differ depending on the message type. A struct ifinfomsg is defined in <linux/rtnetlink.h> to represent the header. The address family is usually set to AF_UNSPEC but may be specified in RTM_GETLINK requests to limit the returned links to a specific address family. Currently only used in kernel→user messages to report the link layer type of a link. The value corresponds to the ARPHRD_* defines found in <linux/if_arp.h>. Translation from/to strings can be done using the functions nl_llproto2str()/nl_str2llproto(). Carries the interface index and is used to identify existing links. In kernel→user messages the value of this field represents the current state of the link flags. In user→kernel messages this field is used to change flags or set the initial flag state of new links. Note that in order to change a flag, the flag must also be set in the Flags Change Mask field. The primary use of this field is to specify a mask of flags that should be changed based on the value of the Flags field. A special meaning is given to this field when present in link notifications, see TODO. All link message types may carry netlink attributes. They are defined in the header file <linux/if_link.h> and share the prefix IFLA_. Lookup link by 1. interface index or 2. link name (IFLA_IFNAME) and return a single RTM_NEWLINK message containing the link configuration and statistics or a netlink error message if no such link was found. If the address family is set to PF_BRIDGE, only bridging devices will be returned. If the address family is set to PF_INET6, only ipv6 enabled devices will be returned. NLM_F_DUMP If set, all links will be returned in form of a multipart message. Creates a new or updates an existing link. Only virtual links may be created but all links may be updated. EAFNOSUPPORT if a address family specific configuration (IFLA_AF_SPEC) is not supported. This message type is used in reply to a RTM_GETLINK request and carries the configuration and statistics of a link. If multiple links need to be sent, the messages will be sent in form of a multipart message. The message type is also used for notifications sent by the kernel to the multicast group RTNLGRP_LINK to inform about various link events. It is therefore recommended to always use a separate link socket for link notifications in order to separate between the two message types. Lookup link by 1. interface index or 2. link name (IFLA_IFNAME) and delete the virtual link. To retrieve the list of links in the kernel, allocate a new link cache using rtnl_link_alloc_cache() to hold the links. It will automatically construct and send a RTM_GETLINK message requesting a dump of all links from the kernel and feed the returned RTM_NEWLINK to the internal link message parser which adds the returned links to the cache. The cache will contain link objects (struct rtnl_link, see Link Object) and can be accessed using the standard cache functions. By setting the family parameter to an address familly other than AF_UNSPEC, the resulting cache will only contain links supporting the specified address family. If only a single link is of interest, the link can be looked up directly without the use of a link cache using the function rtnl_link_get_kernel(). It will construct and send a RTM_GETLINK request using the parameters provided and wait for a RTM_NEWLINK or netlink error message sent in return. If the link exists, the link is returned as link object (see Link Object). While using this function can save a substantial amount of bandwidth on the netlink socket, the result will not be cached, subsequent calls to rtnl_link_get_kernel() will always trigger sending a RTM_GETLINK request. Applications which require to translate interface index to a link name or vice verase may use the following functions to do so. Both functions require a filled link cache to work with. Several types of virtual link can be added on the fly using the function rtnl_link_add(). The deletion of virtual links such as VLAN devices or dummy devices is done using the function rtnl_link_delete(). The link passed on to the function can be a link from a link cache or it can be construct with the minimal attributes needed to identify the link. The function will construct and send a RTM_DELLINK request message and returns any errors returned by the kernel. A link is represented by the structure struct rtnl_link. Instances may be created with the function rtnl_link_alloc() or via a link cache (see Get list of links) and are freed again using the function rtnl_link_put(). The name serves as unique, human readable description of the link. By default, links are named based on their type and then enumerated, e.g. eth0, eth1, ethn but they may be renamed at any time. Kernels >= 2.6.11 support identification by link name. The interface index is an integer uniquely identifying a link. If present in any link message, it will be used to identify an existing link. Each link can be assigned a numeric group identifier to group a bunch of links together and apply a set of changes to a group instead of just a single link. The link layer address (e.g. MAC address). The maximum transmission unit specifies the maximum packet size a network device can transmit or receive. This value may be lower than the capability of the physical network device. The flags of a link enable or disable various link features or inform about the state of the link. The transmission queue holds packets before packets are delivered to the driver for transmission. It is usually specified in number of packets but the unit may be specific to the link type. The operational status has been introduced to provide extended information on the link status. 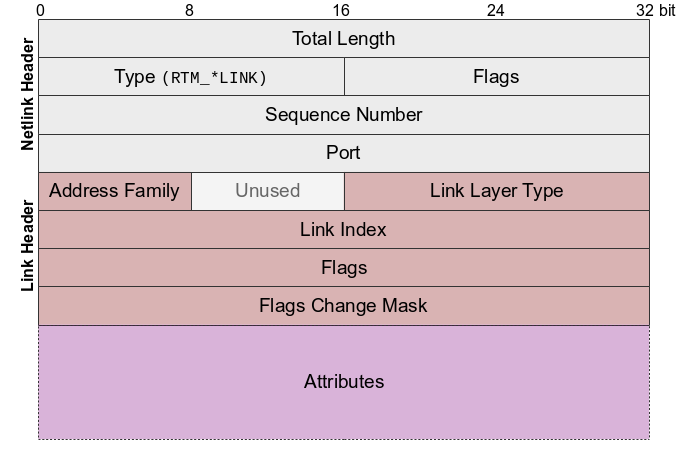 Traditionally the link state has been described using the link flags IFF_UP, IFF_RUNNING, IFF_LOWER_UP, and IFF_DORMANT which was no longer sufficient for some link types. Alternative name for the link, primarly used for SNMP IfAlias. The name of the queueing discipline used by the link is of informational nature only. It is a read-only attribute provided by the kernel and cannot be modified. The set function is provided solely for the purpose of creating link objects to be used for comparison. For more information on how to modify the qdisc of a link, see section Traffic Control. The number of subsystem currently depending on the link being promiscuous mode. A value of 0 indicates that the link is not in promiscuous mode. It is a read-only attribute provided by the kernel and cannot be modified. The set function is provided solely for the purpose of creating link objects to be used for comparison. The number of RX/TX queues the link provides. The attribute is writable but will only be considered when creating a new network device via netlink. This attribute is unused and obsoleted in all recent kernels. The traffic control architecture allows the queueing and prioritization of packets before they are enqueued to the network driver. To a limited degree it is also possible to take control of network traffic as it enters the network stack. Queueing disciplines (qdisc) provide a mechanism to enqueue packets in different forms. They may be used to implement fair queueing, prioritization of differentiated services, enforce bandwidth limitations, or even to simulate network behaviour such as packet loss and packet delay. Qdiscs can be classful in which case they allow traffic classes described in the next paragraph to be attached to them. Traffic classes (class) are supported by several qdiscs to build a tree structure for different types of traffic. Each class may be assigned its own set of attributes such as bandwidth limits or queueing priorities. Some qdiscs even allow borrowing of bandwidth between classes. Classifiers (cls) are used to decide which qdisc/class the packet should be enqueued to. Different types of classifiers exists, ranging from classification based on protocol header values to classification based on packet priority or firewall marks. Additionally most classifiers support extended matches (ematch) which allow extending classifiers by a set of matcher modules, and actions which allow classifiers to take actions such as mangling, mirroring, or even rerouting of packets. The default qdisc used on all network devices is pfifo_fast. Network devices which do not require a transmit queue such as the loopback device do not have a default qdisc attached. The pfifo_fast qdisc provides three bands to prioritize interactive traffic over bulk traffic. Classification is based on the packet priority (diffserv). If the network device provides multiple transmit queues the mq qdisc is used by default. It will automatically create a separate class for each transmit queue available and will also replace the single per device tx lock with a per queue lock. The following figure illustrates a possible combination of different queueing and classification modules to implement quality of service needs. Each type traffic control module (qdisc, class, classifier) is represented by its own structure. 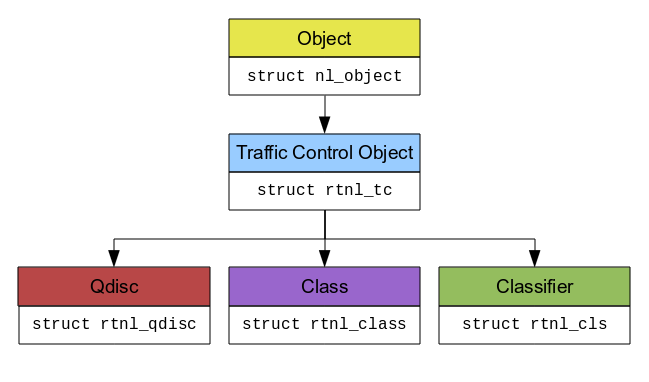 All of them are based on the traffic control object represented by struct rtnl_tc which itself is based on the generic object struct nl_object to make it cacheable. The traffic control object contains all attributes, implementation details and statistics that are shared by all of the traffic control object types. It is not possible to allocate a struct rtnl_tc object, instead the actual tc object types must be allocated directly using rtnl_qdisc_alloc(), rtnl_class_alloc(), rtnl_cls_alloc() and then casted to struct rtnl_tc using the TC_CAST() macro. The handle uniquely identifies a tc object and is used to refer to other tc objects when constructing tc trees. The interface index specifies the network device the traffic object is attached to. The function rtnl_tc_set_link() should be preferred when setting the interface index. It stores the reference to the link object in the tc object and allows retrieving the mtu and linktype automatically. The link type specifies the kind of link that is used by the network device (e.g. ethernet, ATM, …). It is derived automatically when the network device is specified with rtnl_tc_set_link(). The default fallback is ARPHRD_ETHER (ethernet). The kind character string specifies the type of qdisc, class, classifier. Setting the kind results in the module specific structure being allocated. Therefore it is imperative to call rtnl_tc_set_kind() before using any type specific API functions such as rtnl_htb_set_rate(). The Minimum Packet Unit specifies the minimum packet size which will be transmitted ever be seen by this traffic control object. This value is used for rate calculations. Not all object implementations will make use of this value. The default value is 0. The Maximum Transmission Unit specifies the maximum packet size which will be transmitted. The value is derived from the link specified with rtnl_tc_set_link() if not overwritten with rtnl_tc_set_mtu(). If no link and MTU is specified, the value defaults to 1500 (ethernet). The overhead specifies the additional overhead per packet caused by the network layer. This value can be used to correct packet size calculations if the packet size on the wire does not match the packet size seen by the kernel. The default value is 0. TC_H_INGRESS: same as TC_H_ROOT but on the ingress side of the network stack. Generic statistics, see Accessing Statistics for additional information. The traffic control object holds a set of generic statistics. Not all traffic control modules will make use of all of these statistics. Some modules may provide additional statistics via their own APIs. RTNL_TC_RATE_BPS and RTNL_TC_RATE_PPS only return meaningful values if a rate estimator has been configured. The queueing discipline (qdisc) is used to implement fair queueing, priorization or rate control. It provides a enqueue() and dequeue() operation. Whenever a network packet leaves the networking stack over a network device, be it a physical or virtual device, it will be enqueued to a qdisc unless the device is queueless. The enqueue() operation is followed by an immediate call to dequeue() for the same qdisc to eventually retrieve a packet which can be scheduled for transmission by the driver. Additionally, the networking stack runs a watchdog which polls the qdisc regularly to dequeue and send packets even if no new packets are being enqueued. This additional watchdog is required due to the fact that qdiscs may hold on to packets and not return any packets upon dequeue() in order to enforce bandwidth restrictions. The figure illustrates a trivial example of a classless qdisc consisting of three bands (queues). Use of multiple bands is a common technique in qdiscs to implement fair queueing between flows or prioritize differentiated services. Classless qdiscs can be regarded as a blackbox, their inner workings can only be steered using the configuration parameters provided by the qdisc. There is no way of taking influence on the structure of its internal queues itself. Classful qdiscs allow for the queueing structure and classification process to be created by the user. 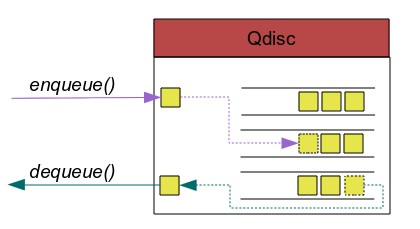 The figure above shows a classful qdisc with a classifier attached to it which will make the decision whether to enqueue a packet to traffic class 1:1 or 1:2. Unlike with classless qdiscs, classful qdiscs allow the classification process and the structure of the queues to be defined by the user. This allows for complex traffic class rules to be applied. This qdisc will drop all packets passed to it. The CBQ (Class Based Queueing) is a classful qdisc which allows creating traffic classes and enforce bandwidth limitations for each class. The DRR (Deficit Round Robin) scheduler is a classful qdisc impelemting fair queueing. Each class is assigned a quantum specyfing the maximum number of bytes that can be served per round. Unused quantum at the end of the round is carried over to the next round. The function rtnl_qdisc_alloc_cache() is used to retrieve the current qdisc configuration in the kernel. It will construct a RTM_GETQDISC netlink message, requesting the complete list of qdiscs configured in the kernel. In order to add a new qdisc to the kernel, a qdisc object needs to be allocated. It will hold all attributes of the new qdisc. The next step is to specify all generic qdisc attributes using the tc object interface described in the section Attributes. Finally, the qdisc is ready to be added and can be passed on to the function rntl_qdisc_add() which takes care of constructing a netlink message requesting the addition of the new qdisc, sends the message to the kernel and waits for the response by the kernel. The function returns 0 if the qdisc has been added or updated successfully or a negative error code if an error occured. The kernel operation for updating and adding a qdisc is the same. Therefore when calling rtnl_qdisc_add() any existing qdisc with matching handle will be updated unless the flag NLM_F_EXCL is specified. Create qdisc if it does not exist, otherwise -NLE_OBJ_NOTFOUND is returned. If another qdisc is already attached to the same parent and their handles mismatch, replace the qdisc instead of returning -EEXIST. Return -NLE_EXISTS if a qdisc with matching handles exists already. The function rtnl_qdisc_add() requires administrator privileges. The function rtnl_qdisc_delete() requires administrator privileges. The default class is the fallback class to which all traffic which remained unclassified is directed to. If no default class or an invalid default class is specified, packets are transmitted directly to the next layer (direct transmissions). The rate (bytes/s) specifies the maximum bandwidth an invidivual class can use without borrowing. The rate of a class should always be greater or erqual than the rate of its children. The ceil rate specifies the maximum bandwidth an invidivual class can use. This includes bandwidth that is being borrowed from other classes. Ceil defaults to the class rate implying that by default the class will not borrow. The ceil rate of a class should always be greater or erqual than the ceil rate of its children.